A new piece of conceptual artwork has been unearthed on Tomb Raider Forums which appears to depict a loading screen from Tomb Raider Anniversary. Eidos has not officially released this artwork, so we cannot with unequivocal certainty confirm its authenticity, but it sure looks like the real deal to us. Inspired by the first Tomb Raider videogame, originally released in 1996, Tomb Raider Anniversary is a totally new 2006 adventure for Lara, faithfully preserving the elements which made the original Tomb Raider such a classic, selling over 7 million copies worldwide. 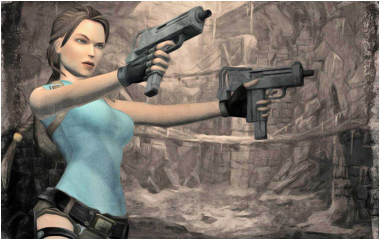 Using an enhanced Tomb Raider Legend game engine, the graphics, technology, physics and engine bring Lara Croft's adventure and pursuit of a mystical artefact known only as the Scion right up to today's technology standards and will offer gamers a completely new game-play experience.